Kannapolis - The stars were out in Kannapolis on the evening of June 25 and it wasn't just the night sky. A new film entitled, War Room, premiered at the GEM Theatre and several of the film's stars were on-hand, as were the co-producers and writers of the film, Alex and Stephen Kendrick. The Kendrick brothers have already gained fame for previous films like Courageous, Facing the Giants and Fireproof. This latest installment of faith-based films highlights the area of prayer and it's importance to one's spiritual walk with God. Much of the movie was filmed in and around Cabarrus County, which is why the Kendrick brothers chose Kannapolis as the perfect place for the world premier. "Over 85 area churches rose up to help us make this movie," said Stephen Kendrick. "So we wanted to come back here with the people who shed blood, sweat and tears last summer to film this and celebrate with them." Several scenes were shot at The Refuge church, located on Kannapolis Highway near Kannapolis and the North Carolina Research Campus is featured towards the end of the film. Many of the corporate scenes were shot with Charlotte's skyline serving as the back drop. "We didn't have any hurdles shooting (in Cabarrus County)," said Alex Kendrick. "The community really came out to support us...we would do it again in a heartbeat." In fact, all of the cast and crew on-hand for interviews at the premier raved about filming in this area. "The people here are so nice," said comedian,Michael Jr., who plays lead actor, T.C. Stallings' character's best friend in the film. "Everyone just came together." Leading Actress, Priscilla Shirer, who lives in Texas, also said she and her family had grown quickly fond of the Charlotte/Concord area. "When we landed back in Charlotte to be here tonight, my boys asked if we could just move here!" Stallings added, "It was a great location, it was beautiful and we had a good time!" evident the two are not happy in their marriage. When Elizabeth is enlisted to sell a house for an aging widow, Miss Clara (played by Karen Abercrombie, who lives in Mooresville), she is introduced to a new way to pray that involves strategy and being intentional. As the movie unfolds, the couple finds that power of prayer can breakdown walls long since built. However, it also remains true-to-life in that it does not sugar coat issues that many couples struggle with or hide from the fact that there are consequences for deceitful actions, whether you pray or not. Stephen Kendrick said this movie is different from their previous films because it "crosses racial lines and is much more a picture of the Body of Christ...As the world is becoming more racially divided, the Church is becoming more racially united and this movie is a demonstration of that." The movie opens nation wide on August 28. 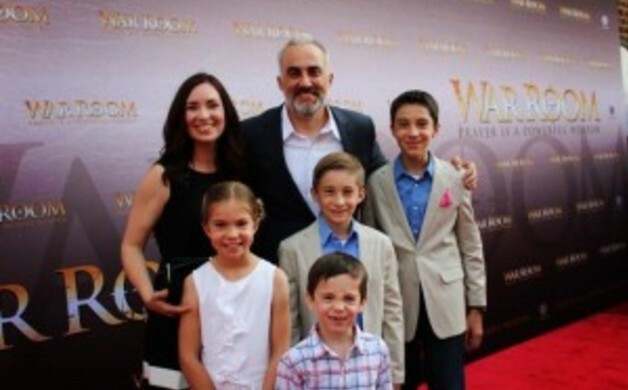 For more information on the film, visit www.warroomthemovie.com.